I have mentioned before that writing is a solitary craft. In order to create, most of us have a nook or hideaway where it’s quiet, far away from distractions and where we can labour away till our heart’s content. But that’s just during the creation process. There is nothing more satisfying than connecting with other writers. It somehow makes what we do more real and allows us to learn from others, get feedback, brainstorm, network and workshop. This is where you’ll find answers and solutions to any problems you may be facing. Perhaps you’re stuck on plot development, or a character. Maybe you need some opinions on style or grammar, and what’s trending right now. Because these forums have such a diverse group of members, from beginners to published authors, you will have so many different perspectives, that blockages or brick walls will be a thing of the past. Some particularly good ones are Absolute Write and Writing Forums.org but there are many. All you need is the magic wand of Google. No matter where you live, there is sure to be a workshop, book launch, seminar or writer’s festival not too far away. These gatherings are a great way to physically connect and often listen to published authors speak about the craft of writing. Just hearing for yourself that you are not alone in this act of working with words can be like replacing worn spark plugs in a sluggish car. A good place to find local writing events is your nearest university with a Creative Writing program. Libraries are also likely to have notice boards and events alerts. Join a writer’s group – or start one! 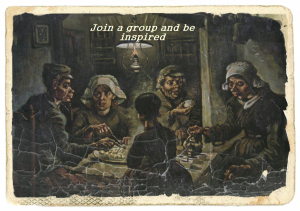 Of course if you have the time and energy, you could start a writing group yourself. It’s not expensive to design and print a simple flyer and post it on the community notice board in your library, or college. The discipline of regular meetings can be valuable and socially enjoyable. You could also take out an ad or announcement in the local newspaper or radio station. Making connections with others is one of the best ways I know to keep motivation and inspiration alive.